Virtual Masking 24 individually configurable masks to hide parts of the scene (background motion such as moving trees, pulsating lights, busy roads, etc.) which should not be considered for flow analysis to trigger Intelligent Tracking. Grey (RAL 7001). Available in specific regions only. Sand finish. Power supply, 120VAC input, 24VAC output @ 96VA. 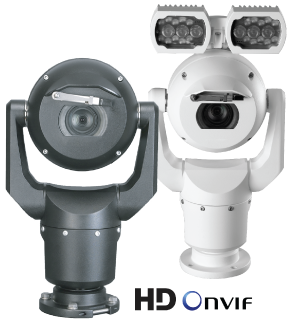 Suitable for powering AUTODOME, MIC IP 7000, and MIC IP fusion 9000i cameras. White aluminum enclosure with cover. IP66 ingress. IK10 impact. Power supply, 230VAC input, 24VAC output @ 96VA. IP power supply unit with PoE, 100 VAC – 240 VAC (90 VAC -264 VAC with tolerance), 50/60 Hz. DCA mount for MIC7000 and MIC IP fusion 9000i cameras. Aluminum. Two M25 holes for conduit/cable glands. Includes an conduit adapter (male M25 to female 3/4" NPT). Available in specific regions only. Aluminum spreader plate suitable for brickwork surface mounting. Shallow conduit adapter for a MIC-WMB, a MIC-PMB, or a MIC-SPR. Three-part molded sunshield for MIC7000 cameras – 1 bottom shell, 2 top shells (1 for around the optional illuminator accessory). White. Washer kit for analog infrared MIC camera models as well as for MIC IP starlight 7000i and MIC IP fusion 9000i camera models.